Built about 1715 by request of Saint Denis to halt the Spanish expansion eastward. Natchitoches Indians, allies of the French, gave their name to the city. Construit vers 1715 à la demande de Juchereau de St-Denis, afin d'arrêter l'expansion espagnole vers l'Est. Les Indiens Natchitoches, alliés aux Français, donnèrent leur nom à la ville. Erected 1955 by Louisiana Department of Commerce and Industry. Location. 31° 45.586′ N, 93° 5.168′ W. Marker is in Natchitoches, Louisiana, in Natchitoches Parish. Marker is on Front Street (State Highway 6) north of Touline Street, on the right when traveling north. Touch for map. Marker is in this post office area: Natchitoches LA 71457, United States of America. Touch for directions. 2. 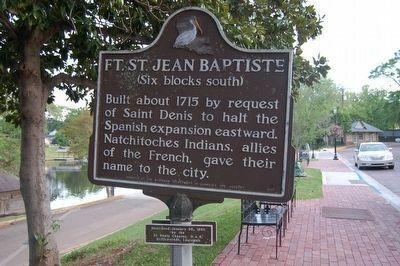 Ft. St. Jean Baptiste Marker, side two in French.
. The Red River Campaign (a few steps from this marker); Saint Denis Tomb (about 400 feet away, measured in a direct line); The Legacy of Catholicism (about 700 feet away); First Mass in Natchitoches (about 700 feet away); Basilica of the Immaculate Conception (about 700 feet away); The Natchitoches Parish Old Courthouse (about 800 feet away); Ducournau Building (approx. 0.2 miles away); The Historic Cane River (approx. 0.2 miles away). Touch for a list and map of all markers in Natchitoches. More. 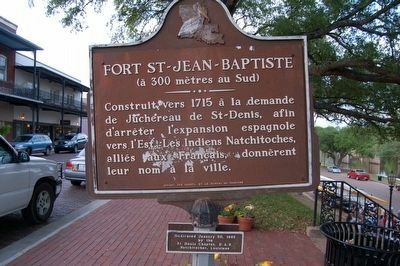 Search the internet for Ft. St. Jean Baptiste. Credits. This page was last revised on February 27, 2017. This page originally submitted on August 8, 2015. This page has been viewed 266 times since then and 7 times this year. Photos: 1, 2. submitted on August 8, 2015. • Bernard Fisher was the editor who published this page.